The clavichord, invented in the early 14th Century, is a predecessor to the piano and to the more recent clavinet. It is a popular instrument for playing music from the Renaissance and Baroque period, but can be found in other music styles such as recordings by Oscar Peterson, Keith Jarrett, Tori Amos and The Beatles. The action of the clavichord is unique among all keyboard instruments. The clavichord produces sound by striking brass or iron strings with small metal blades called tangents. The clavichord has been referred to as the most intimate of keyboard instruments, the player being able to control attack, duration, volume, and even provide certain subtle effects of vibrato known as Bebung by varying the pressure on the key. The Neupert clavichord model for Pianoteq offers the possibility to simulate the original clavichord Bebung when using keyboards with aftertouch capacity. Thanks to the physical modelling, the add-on is able to offer variations including a double choir version, extended to 88 keys with pedal support. The clavichord model has been tested by the music producer Guy Sigsworth who made use of clavichords in recordings of some of Björk’s albums. 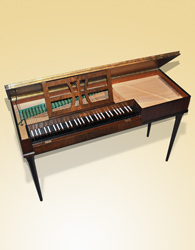 The Pianoteq clavichord add-on is based on a copy built by Neupert in 1941 of a "Modell Philipp Emanuel Bach". This copy was provided by the Kremsegg Schloss Museum (Kremsmünster, Austria) who collaborates with Modartt on the KIViR cultural project which purpose is to provide virtual copies/restorations of historical keyboard instruments. With this clavichord, the KiviR collection offers now all historical predecessors to the piano: cimbalum, clavichord and harpsichord. The collection also includes pianofortes, early pianos and an electro-acoustic piano. The KiviR collection, including the clavichord, can be downloaded freely by all Pianoteq customers.